Accommodation and US Golf Open House rentals can be a real problem when you will plan your vacation week, for this huge sports event. Lucky for you, we have just the places you might want to consider while enjoying your retreat! Check the (hamptonbayshotel.com) to know more details about this amazing place. Affordable rates and great hospitality: The words every golf player participating in the great golf tournament or a spectator trying to get to one, want to hear. Few words about the Hamptons! What comes to your mind when you think of the Hamptons? Wealthy people, golf matches, fancy dinners and exquisite places are pretty much what you should expect. As the golf tournament is considered as one of the main events, hence it is crucial for players as well as bystanders to be punctual. Now if you’re staying off the coast or somewhere far then chances of being punctual are completely slim. Find an available cottage or a suite near to Shinnecock Hills. Within the five-mile radius of the golf field, there are located many cottages and houses available for rent. 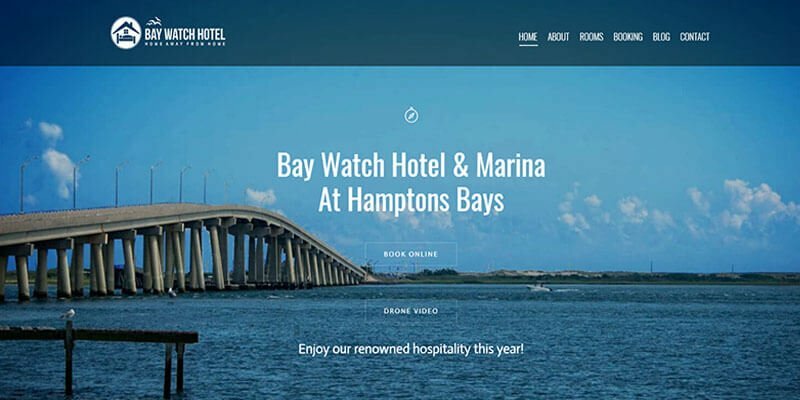 If cottages or houses seem too big for you or not according to your taste then you could try looking for deluxe rooms in the Bay Watch Hotel at the Hampton Bays. Rates start from $399 per night. Pristine outdoor pool with towels. Private marina for your Boat or your Jet Ski. Wi-Fi, 24/7 Services, free of any charges. Free parking 2 cars per room. Entertainment centre w/ Bluetooth, Flat Screen Cable TV. Fully stocked kitchens with all your cooking utensils. Microwaves, Stove. Irons and Ironing boards. Personal sitting outdoor area per room. BBQ stands, Hammocks, Swings and Picnic tables. As the property is located within a five-mile radius, therefore players will have no problem in getting to the field on time. Don’t wait the last minute, you will not find an available stay. Almost all tickets for the tournament is already sold. You can enjoy water sports like Jet Ski as well. Nobody can resist water on a hot day and the tournaments are mostly scheduled as such when the sun is at its utmost glory. So, spraying yourself with water all the while enjoying the fast ride seems like a good option to spend your time. Yacht Rides. Who doesn’t like sailing or yacht parties? You can enjoy them fully during your stay at the Hamptons! End your day with a beautiful view of the stars and cold swirls of the beach. Engage in the good company of people and relish the melodies produced to sway you away for a good escape. Hamptons promises you a nice holiday which you’ll forever relish and remember! So, Don’t wait the last minute and Book your room, early. While one amongst the guiding principles of the sport of golf is to play your ball because it lies, some necessary exceptions should be taken into thought once applying the principles. one amongst these exceptions happens once temporary obstructions square measure put in on golf links.